Ransomware programs are gaining popularity day by day. That is mostly because they allow cyber criminals to make huge illegal profits at the expense of unsuspecting Internet users. Thus, if you ever happen to encounter a program that goes by the name of Spectre Ransomware while surfing the web, be sure to refrain from it at all costs. It is crucial since ransomware applications can easily lock enormous quantities of data on the affected computer without any notification or authorization. It should be more than obvious that having such a tool active on your PC could have disastrous outcomes. Therefore, our malware experts present you with a few precautionary steps that will help you maintain a safe and secure operating system at all times. Additionally, we present detailed information about the overall functionality of Spectre Ransomware along with its comprehensive removal guide, which you should us as soon as possible if this malware is already active on your PC. Spectre Ransomware works in a relatively simple manner. Its features do not stand out among other ransomware applications that are active nowadays. As soon as it gains full access to your operating system, it starts doing its dirty work. Once it scans your hard drive for its contents, it initiates the encryption procedure. Using a powerful cipher known as AES-256 this malicious lock a large variety of data on the affected computer. Our researchers have discovered that this malware does not target files that are essential for your operating system's functionality. It mostly affects file types such as .pdf, .rtf, .xls, .xlsx, .ppt, bmp, .jpg, .jpeg, .gif, .txt, .doc, .docx, and quite a few others. Each file locked by this devious program will receive a .spectre extension. Unfortunately, manual decryption procedure is out of the question due to the strength of the algorithm that is used to lock data. As soon as all of that is done, you will notice a devious .txt file in a number of folders. That is a ransom note that is usually called HowToDecryptIMPORTANT!. It informs the users about what has happened and what should be done to receive decryption services. While paying to regain your data might seem like a viable option, you must know that there is no guarantee that your files will actually get decrypted even if you make the payment. So making any kind of payment is a risk that we urge you not to take. Be sure to delete Spectre Ransomware at the very same time that it is found up and running on your personal computer. To get rid of it without encountering major problems, simply use the instructions below. It goes without saying that keeping your PC safe and secure at all times should be your priority. To do that, make sure to take a few simple, yet very effective precautionary steps. Firstly, to improve your overall virtual security, you need to install a professional antimalware tool if you do not have one already. Such a tool is paramount because it can warn you in advice about any virtual threat just as well as it can terminate any devious program in a fully automated manner. Besides such a tool, you also need to practice safe browsing habits. This means that you must refrain from all questionable and otherwise suspicious download websites because they are known to be the primary source of bundled installers, which are infamous for hosting not only suspicious programs but malicious ones as well. Furthermore, we urge you to bypass all e-mail attachments that come your way from unknown third-parties. This is critical because malware developers notoriously use spam e-mail campaigns to distribute their invasive application. These relatively simple preventative steps will allow you to avoid programs such as Spectre Ransomware at all times. Under no circumstances delay the termination procedure of Spectre Ransomware if you consider yourself to be a security-conscious user. Be sure to follow the instructions that we provide below with care because it is important to terminate every single bit of Spectre Ransomware to stop its malicious functionally. If just a few traces are active on your PC, you could be facing devastating outcomes. That is so because there is a possibility that this malicious application could be restored with the help of its files. In other situations, those same leftovers might be enough for Spectre Ransomware to continue it devious functionality. If you wish to be sure that everything associated with this ransomware has been removed successfully, simply scan your entire operating system with a reliable antimalware tool as soon as you are done with the manual removal. 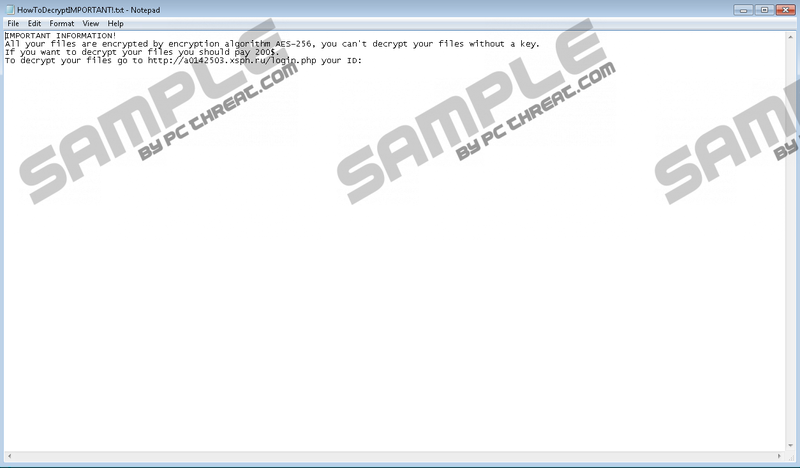 Select a malicious .exe file and tap Delete on your keyboard. Note that the name of this file is random. Quick & tested solution for Spectre Ransomware removal.